Inspirational, uplifting messages from God for your every day life. “Therefore, if anyone is in Christ, he is a new creation; old things have passed away; behold, all things have become new” (2 Corinthians 5:17 NKJV). Picture for a moment a worn-out tin can – useless, perhaps even rusty and battered, something that needs to be disposed. And now look at this crown –made from of a seemingly useless tin can. If you allow it, God can do the same in your life. Put your life in God’s hands, believe and trust in His son Jesus Christ. He binds up your wounds, He forgives you, He heals you, He restores your dignity and makes you a child of the King. This has all been possible through the precious help of my Swiss friend that I have never met in person. Her name is Martina Häfliger Zimmerling. And thanks to Martina I am now able to make these beautiful tin cans here in America. & 7% tax and shipping. 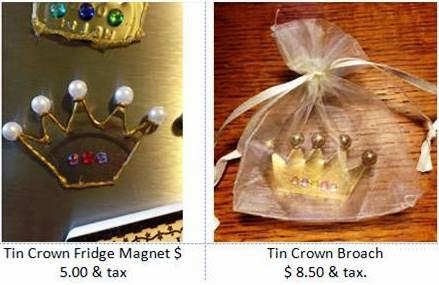 The Tin Crowns are also available as broaches and fridge magnets. To place an order please click here. 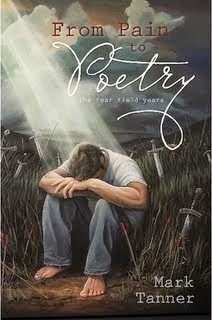 My husband's first poetry book, now available to order! (C) Suzanne Tanner 2008. Watermark theme. Powered by Blogger.